This in total is 15 weeks to do documentation, with a presentation on the due date. (W-7) 26th March – Create a plan. Then Research some more effects and specifics about realistic particle simulation. (W-8) 2nd April – Make a start on the documentation, making the templates for each document and make lists of the parts I’ll be doing. (W-11) 23rd April – Will be travelling at this time, but can do little things when needed. (W-12) 30th April – End of document Drafting – most of the documents should be complete by now. (W-13) 7th May – Final drafts to start. (W-14) 14th May – Back from Travelling – Knuckle down in final drafts. Start presentation. (W-15) 21st May – Final documentation and publishing. Finish presentation, Do mock recording etc. (W-16) 28th May – Due date! Everything should be done and handed in on this day. Everything should be done before this but leaving a week for any catch up. On each of these days I’ll be writing a blog entry like this one. On the date of final documentation and publishing, I’ll copy all the blog entries into a document for handing in. As it is easy to track things online. These will need to be submitted both by PDF and a binded document. I’ll need to make sure I have enough printer ink and buy the binder. For this task, I will need to use WordPress to log each week of what I’ve been researching and which peer reviews, information I can find about the system. At the end of the week I will need to copy them to a word document and spell check them. This will be printed and binded. I will be watching a lot of videos on real special effects like plane crashes and gun shooting to see how fire and smoke acts in real life, and then study images of fire to reproduce it. Work out whether saving files to the server or directly to the user’s hard drive is better. Should I use a conbination of both? Undo and Redo feature using “Memento pattern”. I might need to elaborate on these more and explore / find new ideas as the documentation develops. Each of these will need to be saved as separate PDFs, and printed along with other material to be binded. What are the best features of Fume FX? What are the things that you cannot live without? Do you find the interface overwhelming? Are all options used or are there settings that are mostly used and some that should be default anyway? Would you pay for software like this particle tool idea? Do you think having it run in a browser would be beneficial? Why / why not? What are the hardest special effects to create? What features do you wish were there / were easier? Would a GUI speed boost make workflow a lot easier? What sort of interface would work better? Is one like Photoshop a good choice? Would an interface that goes away from the trends of Photoshop be a burden? The general idea is to prove my niche really. I need to know these things so I can design the interface around these. These will all be recorded and preseted as part of the peer review documentation. I will the end it with a conclusion. The “frame” will be a square but a “fade out” can be applied in a spherical matter inside the frame, as this is a pre-particle exporter, the effects need to be technically sections of a larger particle system. Interface will be designed around simply the default styles that three.js comes with. Game engine preview – will show the rendered version with all effects added using a 3 point light system that can be customised. This will not be rendered, as lighjting in games can change. For example a water particle cannot have a bright light reflection rendered at the top-left because the game’s light might be under it. Motion vector preview – a normal map looking (x y z velocity represented as red green blue channels) as to visualize movement in a single frame. To be usable, the system needs to have an undo / redo feature. This should be done using the “Memento pattern” and should be implemented from the start. Toolbars, one on the left, the right, the bottom and top. I will try and make them simple without many options as one of the aims of this project is to have a program that’s less daunting and easy to learn. The name of the program I’m leaning towards something like “Plasmation”. Because the word isn’t really a word, apart from being seen in some online places, which say it’s “forming or moulding” when this tool is like moulding a special effect particle. It also has “plasma” in it, which, to me, sounds special-effect-y. 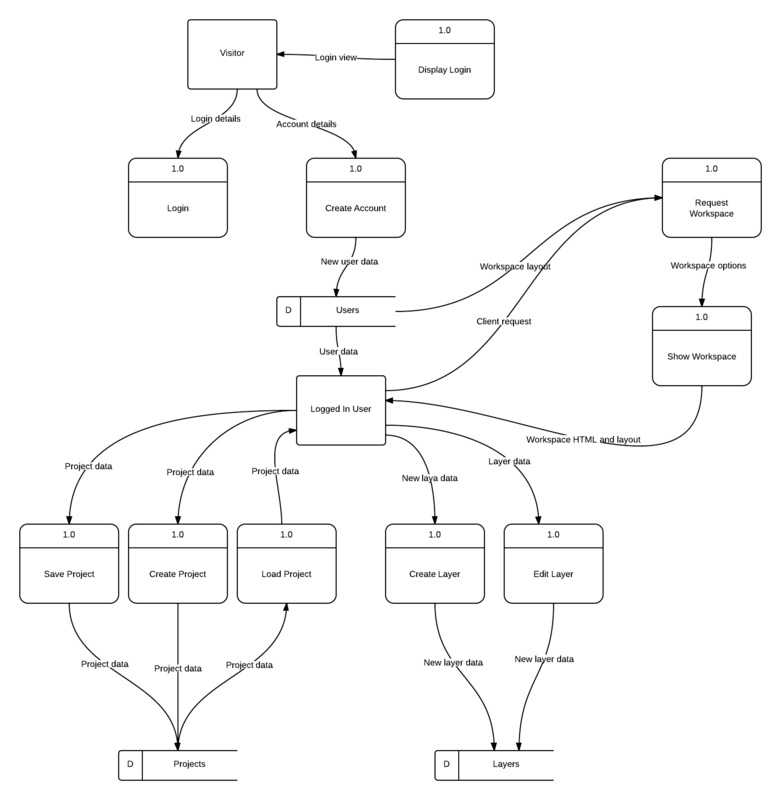 The thing to start off with will be the way the server and client could interact, but as I haven’t done the design documentation, this is just an example (Made with Lucidchart, a great example of an online tool): As you can see, this is a basic flow of data in the logging in / creating account / workspace. In this I will basically talk about why I’ll be using an agile type of development methodology. I will most likely use Scrum because it is what I’m used to. An issue with this is the morning meetings, which I can replace with the journals and discussion of my goals and blocks. Requirement analysis will also need to be documented which is basically a document that describes the requirements of the program. This will be closely tied to the technical documentation. I will need to include this as a separate documentation with an introduction explaining briefly the purpose of the application, scope, objectives and success criteria of the project, and the usual glossary of terms. The second part of the documentation will include requirement and the analysis model of the application. The documentation will finish with references. This section will also include a test plan and test cases for requirements validation. This will consist of a Work Breakdown Structure (WBS), complete with resource allocations, and a gantt chart with critical path. I will be using gantt chart software for this and will discuss in my journals which software is best for this. This part of the documentation will also include a risk assessment and contingency plan. The application could either be free or a subscription-based program with advanced features unavailable. For this project, however, the program will be very basic, and adding user and subscriptions in there just makes another layer of difficulty. For the actual outline, I will be creating a mock one for industry professionals in a form of a pitch to get funding. The actual money involved will cover things like web servers, domain names, time food and workspace programs for myself to create at home, software, internet and power costs.